In a medium bowl, stir together 2 cups flour and confectioners' sugar. Blend in the melted butter and vanilla essence. Press the soft dough with the palm of your hand into the bottom of the greased 9x13 inch pan. Bake the dough in the preheated oven at 170˚C for 15 minutes, or until golden. Meanwhile, in a large bowl, beat eggs until light. Combine the sugar, baking powder and ¼ cup of flour so there will be no flour lumps. Stir the sugar mixture into the eggs. Stir in the lemon juice and lemon rind. Pour over the prepared crust and return to the oven. Bake for an additional 30 minutes or until bars are set. 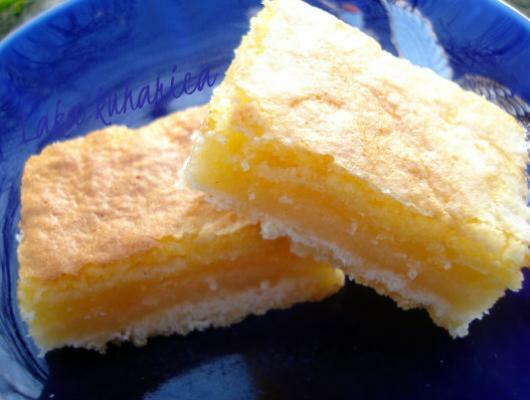 Melt-in-the-mouth cake full of lemony, sweet and sour, aroma. When you start eating it, you simply can't stop!